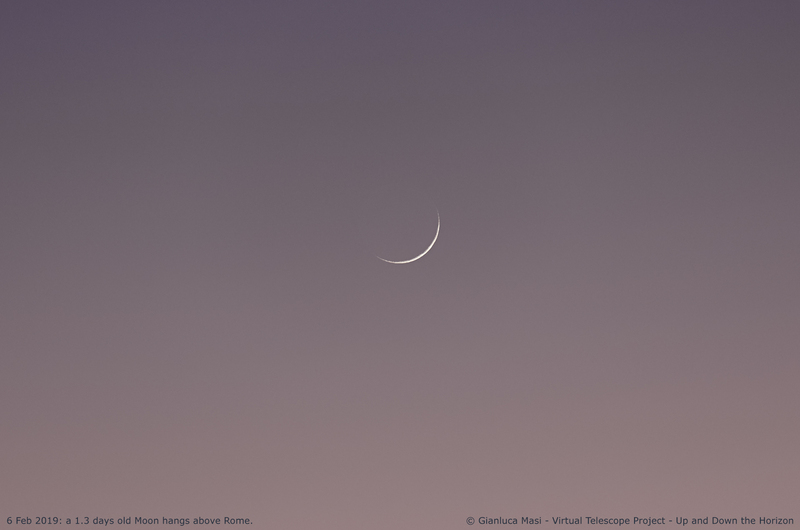 Looking at a very young Moon at twilight is always a wonderful experience. 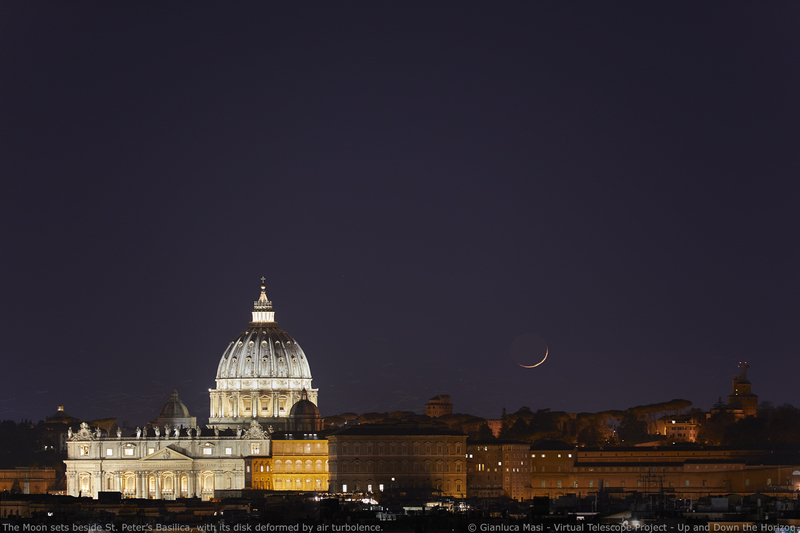 The light and colors all around and the typical lunar earthshine make the experience unique and Rome adds its celebrated skyline for an unforgettable sight. 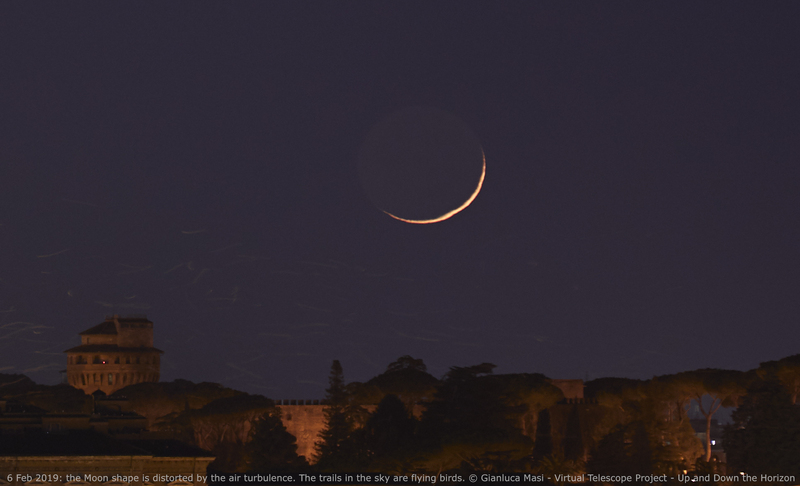 I must admit that every time a very young Moon (that is, our satellite soon after the new Moon, when it is back in the western sky at sunset) is up there, I try to plan an imaging session. 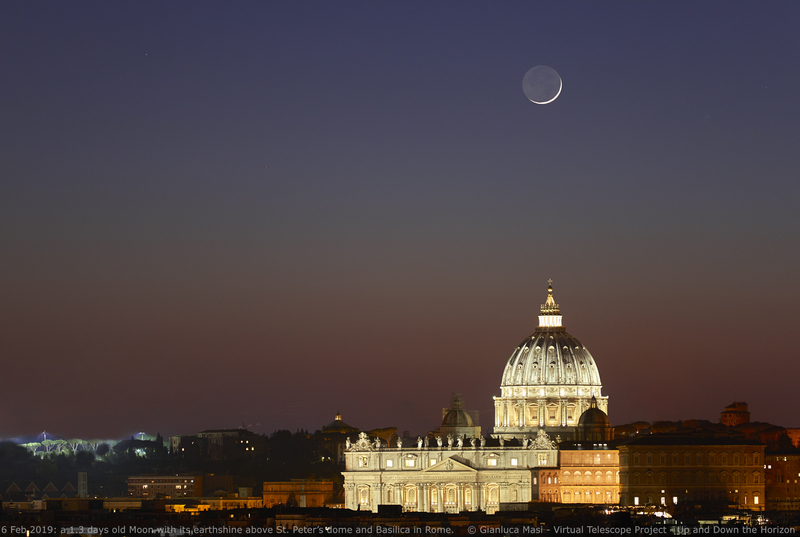 I cannot say how much I love to see it at dusk, soon after sunset, while the typical colors of the twilight frame the Moon, its tiny, sharp crescent and its elegant earthshine (the light reflected by our Earth to the Moon, making visible the portion of our satellite still in the darkness). 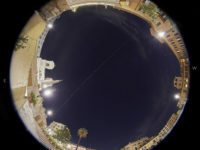 The residual light of the environment makes possible to enjoy also the panorama all around your observing site. 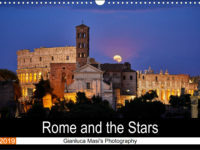 Living in Rome, you can hope that the cosmic show will couple with one of the legendary monuments of the Eternal City. 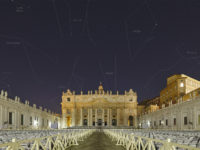 This is possible, of course, but you need to carefully calculate where to go to see the celestial gems up there properly aligned with the monuments you want in your image. This is where it helps to be an astronomer! 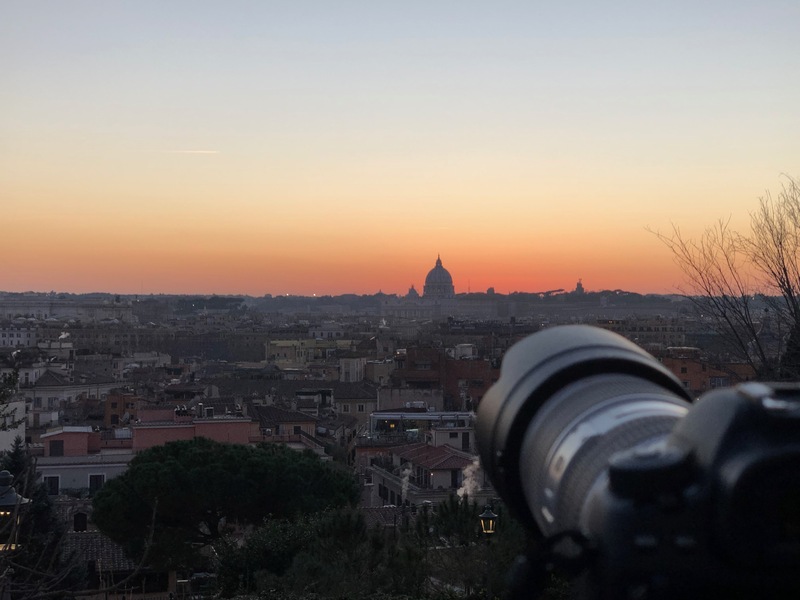 On 6 Feb. 2019, I planned such an imaging session, inspired by the wonderful weather we finally had back, promising wonderful colors at sunset. 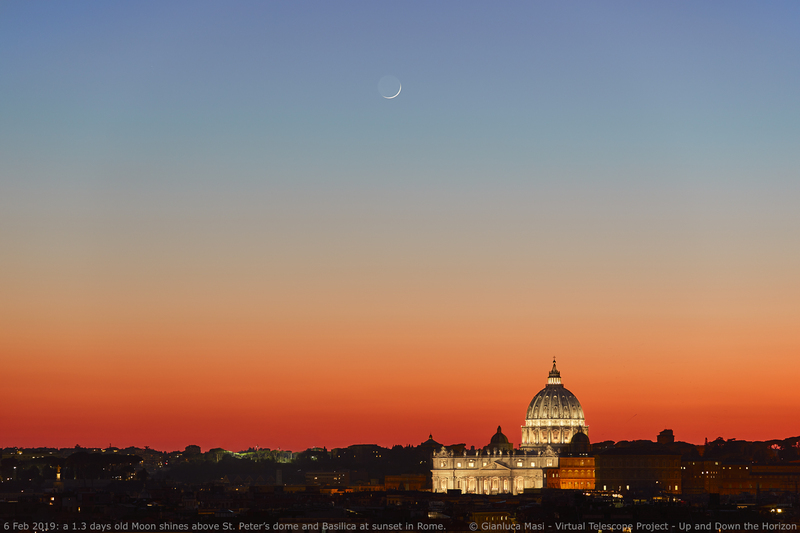 Assuming the position of the Moon on that day, I carefully checked where I could go to shoot my photographs, also having something special from Rome in my images. I ended up choosing a place close to the Pincio, a very celebrated, scenic terrace in Rome. I reached the selected site well in advance, to refine my position and be ready to enjoy every moment of the show. I used one of my Canon 5DmIV DSLR bodies and the excellent Canon EF 70-200mm f/2.8L IS II USM lens, which is very precious for this kind of photography. Needless to say, the sunset was spectacular: it was hard to go back to the planned work, captured by the beauty of the twilight. Of course, I was waiting for the Moon to show and at some point I could spot it in a still very bright sky. I had to carefully select the camera settings to grab an hint of the earthshine, too. Minute after minute, colors and lights all around evolved and it was simply impossible to stop looking! Other people were enjoying the show from there: it is amazing to see how beauty never fails capturing our heart, mind and imagination. The time left me so fast and soon it was time for the Moon to set. 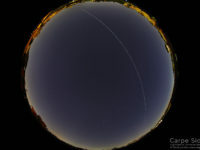 Getting lower and lower above the horizon, our satellite showed where the birds were flying preparing for the night: you can see them as grey trails just above the roofs. 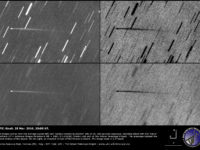 While the Moon was sinking more and more in our atmosphere, it experienced an increasing turbulence. 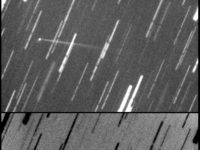 At some point, the effects were so large that the lunar disk was clearly distorted, as you can easily see below. It was hard to say goodbye to this unique show. But I did, knowing the sky is so generous that new opportunity will come very soon, so stay tuned!